September 28th-Great Day of Events! The Cathedral Players are the many St. Mary Cathedral High School students who are interested in theatre and all of its various facets. Membership doesn't stop there: the groups extended family includes younger St. Mary students and numerous parents and parishioners who guide the students throughout the year. By being in the Cathedral Players, students are allowed to blossom into their fullest potential and develop the unique talents that God has given them. It takes a village of support to bring you the productions twice a year-from stage building to set/costume designs and everything in between. In addition to the time put in, the Cathedral Players rely on benefactor support in order to purchase plays and fund essentials to aid in putting on a grand production! Interested in becoming a St. Mary Cathedral Player Benefactor? Call the development office at (989) 732-5448. 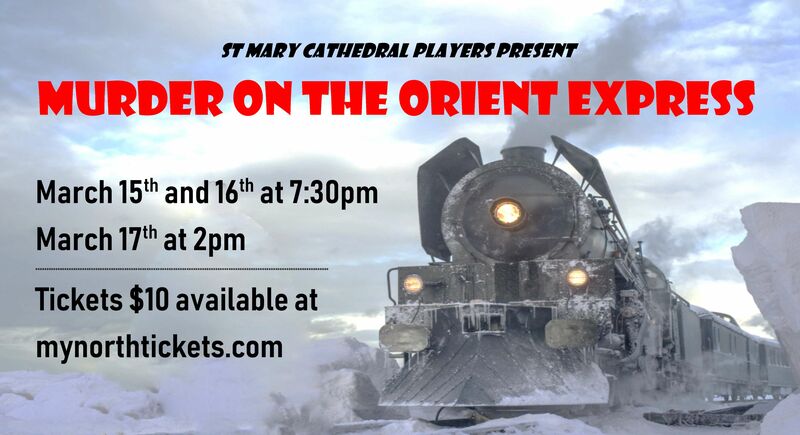 Get Tickets to the Spring Production of Murder on the Orient Express here!